When in Bali you simply must view three of the most famous dances in the country. Sanghyang (Trance) Dance, Kecak (Monkey Dance) and the Fire Dance are three performances that will truly make your visit to Bali more special. Taken from the Hindu epic Ramayana, the Kecak dance is perhaps the most dramatic. The dance tells the story of Prince Rama and his rescue of Princess Sita, performed with a troupe of over 50 bare-chested men who serve as the chorus. There are dozens of different dances - all part of the fascinating Balinese cultures. This tour takes you to the village of Batabulan to see three dances. 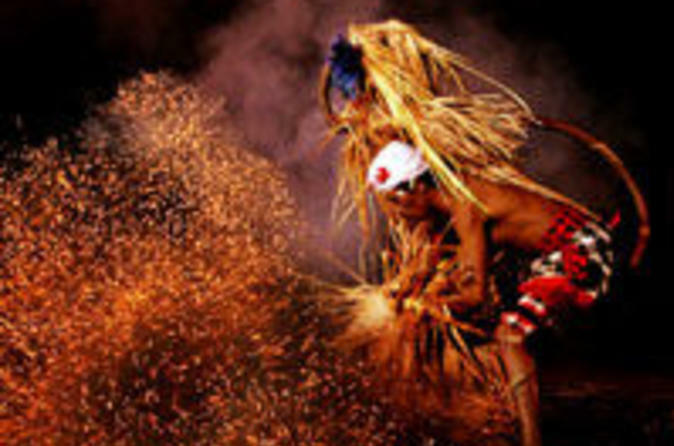 Kecak (Monkey) Dance - Performed by a group of at least 50 men who dance in a circle around blazing bamboo torches. Possibly the most dramatic of the 3 dances, it has been taken from the Hindu epic Ramayana, the dance tells the story of Prince Rama and his rescue of Princess Sita, who has been kidnapped by the evil King of Lanka. The chorus of men, who provide the orchestral accompaniment with complex and varied chants that company their swaying movements. The only music to accompany them are the beats of their palms hitting their chests, their thighs, or other parts of their bodies, or their claps, rhythmically accompanied by shouting and chanting. Flickering torches provide lighting and an enchanting atmosphere. Fire Dance - Where the dancer becomes entranced and is able to dance on hot coals without feeling pain. Saghyang (Trance) Dance - Traditional performed as an exorcism to promote peace and health within the village.